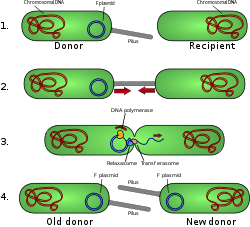 A type III secretion system means that a molecular syringe is used through which a bacterium (e.g. certain types of Salmonella, Shigella, Yersinia) can inject nutrients into protist cells. One such mechanism was first discovered in Y. pestis and showed that toxins could be injected directly from the bacterial cytoplasm into the cytoplasm of its host’s cells rather than simply be secreted into the extracellular medium. Birds have bony beaks that are specialised according to the bird’s ecological niche. For example, macaws primarily eat seeds, nuts, and fruit, using their impressive beaks to open even the toughest seed. First they scratch a thin line with the sharp point of the beak, then they shear the seed open with the sides of the beak. The shapes, sizes and numbers of types of animals’ teeth are related to their diets. For example, herbivores have a number of molars which are used to grind plant matter, which is difficult to digest. Carnivores have canine teeth which are used to kill and tear meat. An earthworm‘s digestive system consists of a mouth, pharynx, esophagus, crop, gizzard, and intestine. The mouth is surrounded by strong lips, which act like a hand to grab pieces of dead grass, leaves, and weeds, with bits of soil to help chew. The lips break the food down into smaller pieces. In the pharynx, the food is lubricated by mucus secretions for easier passage. 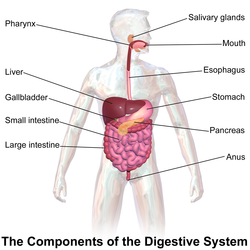 The esophagus adds calcium carbonate to neutralize the acids formed by food matter decay. Temporary storage occurs in the crop where food and calcium carbonate are mixed. The powerful muscles of the gizzard churn and mix the mass of food and dirt. When the churning is complete, the glands in the walls of the gizzard add enzymes to the thick paste, which helps chemically breakdown the organic matter. By peristalsis, the mixture is sent to the intestine where friendly bacteria continue chemical breakdown. This releases carbohydrates, protein, fat, and various vitamins and minerals for absorption into the body. Underlying the process is muscle movement throughout the system through swallowing and peristalsis. Each step in digestion requires energy, and thus imposes an “overhead charge” on the energy made available from absorbed substances. Differences in that overhead cost are important influences on lifestyle, behavior, and even physical structures. Examples may be seen in humans, who differ considerably from other hominids (lack of hair, smaller jaws and musculature, different dentition, length of intestines, cooking, etc.). The stomach’s high acidity inhibits the breakdown of carbohydrates within it. This acidity confers two benefits: it denatures proteins for further digestion in the small intestines, and provides non-specific immunity, damaging or eliminating various pathogens. ^ Cascales E, Christie PJ (2003). “The versatile Type IV secretion systems”. Nature Reviews Microbiology. 1 (2): 137–149. doi:10.1038/nrmicro753. PMC 3873781. PMID 15035043. ^ Christie PJ; Atmakuri K; Jabubowski S; Krishnamoorthy V; Cascales E. (2005). “Biogenesis, architecture, and function of bacterial Type IV secretion systems”. Annu Rev Microbiol. 59: 451–485. doi:10.1146/annurev.micro.58.030603.123630. PMC 3872966. PMID 16153176. ^ Chatterjee, S.N. ; Das, J (1967). “Electron microscopic observations on the excretion of cell-wall material by Vibrio cholerae“. Journal of General Microbiology. 49 (1): 1–11. doi:10.1099/00221287-49-1-1. PMID 4168882. ^ Kuehn, M.J.; Kesty, N.C. (2005). “Bacterial outer membrane vesicles and the host-pathogen interaction”. Genes & Development. 19 (22): 2645–2655. doi:10.1101/gad.1299905. PMID 16291643. ^ McBroom, A.J. ; Kuehn, M.J. (2007). “Release of outer membrane vesicles by Gram-negative bacteria is a novel envelope stress response”. Molecular Microbiology. 63 (2): 545–558. doi:10.1111/j.1365-2958.2006.05522.x. PMC 1868505. PMID 17163978. ^ Leege, Lissa. “How does the Venus flytrap digest flies?”. Scientific American. Retrieved 2008-08-20. ^ Boettner, D.R. ; Huston, C.D. ; Linford, A.S.; Buss, S.N. ; Houpt, E.; Sherman, N.E. ; Petri, W.A. (2008). “Entamoeba histolytica Phagocytosis of Human Erythrocytes Involves PATMK, a Member of the Transmembrane Kinase Family”. PLoS Pathogens. 4 (1): e8. doi:10.1371/journal.ppat.0040008. PMC 2211552. PMID 18208324. ^ Miserez, A; Li, Y; Waite, H; Zok, F (2007). “Jumbo squid beaks: Inspiration for design of robust organic composites”. Acta Biomaterialia. 3 (1): 139–149. doi:10.1016/j.actbio.2006.09.004. PMID 17113369. ^ Gordon John Larkman Ramel (2008-09-29). “The Alimentary Canal in Birds”. Retrieved 2008-12-16. ^ Kong F, Singh RP (June 2008). 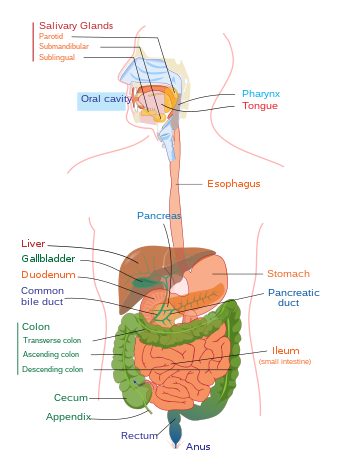 “Disintegration of solid foods in human stomach”. J. Food Sci. 73 (5): R67–80. doi:10.1111/j.1750-3841.2008.00766.x. PMID 18577009. ^ “Genetics Home Reference”. US National Library of Medicine. US National Institutes of Health. Retrieved 27 June 2015. ^ Nexo E, Hoffmann-Lücke E (July 2011). “Holotranscobalamin, a marker of vitamin B-12 status: analytical aspects and clinical utility”. Am. J. Clin. Nutr. 94 (1): 359S–365S. doi:10.3945/ajcn.111.013458. PMC 3127504. PMID 21593496. ^ Viola-Villegas N, Rabideau AE, Bartholomä M, Zubieta J, Doyle RP (August 2009). “Targeting the cubilin receptor through the vitamin B(12) uptake pathway: cytotoxicity and mechanistic insight through fluorescent Re(I) delivery”. J. Med. Chem. 52 (16): 5253–5261. doi:10.1021/jm900777v. PMID 19627091.